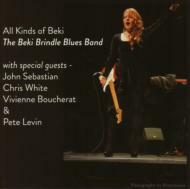 All About Beki is the debut album of Vocalist, guitarist, songwriter and arranger Beki Brindle. She and her working band (which includes the legendary John Sebastian) perform 14 tracks that include her own compositions and her arrangements of songs by Sleepy John Estes and mandolin bluesman Yank Rachell. An Indianapolis native, she encountered Rachell, who had first recorded in 1929 in Memphis, and began playing in his back up band. Schooled in the Memphis-style blues traditions, she later worked with Jerry Lee Lewis, John Sebastian, and her now husband, Ralph Scala, a founder of the Blues Magoos. Now based in the Woodstock area of New York State, she has toured extensively in the UK and the US with the Beki Brindle Band and has developed her own style linking blues traditions to modern blues and rock music.